Which end is the opponent's goal? Show you a way to keep your Soccer Robot in the Soccer Field. Show you a way to get your Soccer Robot player to Kick the Ball. Show you where you can get the latest rules for RCJA GEN II Robot Soccer. Giving you a ready-built robot and complete program would take all the fun out of making a program and robot all of your own to play Robot Soccer. However the snippets of programs presented here should help you get started in the fascinating world of Robot Soccer. 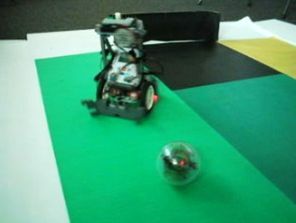 To start finding out about GEN II Robot Soccer, click here.